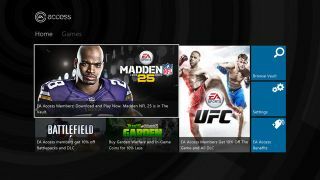 The EA Access subscription gaming service for Xbox One has graduated from its brief period in limited beta testing and is now available to all owners of Microsoft's next-gen console. EA Access also grants gamers 10% off digital purchases of new games and DLC, plus the chance to get their hands on titles days before the public release. EA has confirmed to Polygon this year's Madden 15 game will be exclusively available in its entirety to Access subscribers, for a full five days before the game goes on sale. This will be the only way fans of the franchise will be able to play the game before release as EA won't release a public demo on any platform. The move will surely upset those who look forward to getting to grips with new features before committing to buying the full game. In previous years, EA has launched a free-to-play multi-platform demo for all its major sports franchises. EA Access will be a boon for gamers who habitually snap up the publisher's titles, but will only be available on the Xbox One. So far Microsoft is offering the service in the US, UK, Australia, Austria, Canada, France, Germany, Ireland, Italy, Mexico, New Zealand and Spain. Sony turned down the chance to host the service on the PS4 console, claiming it failed to offer the good value PS Plus does for customers. Still undecided on a next-gen machine? Check out our PS4 review!